One of the most common--and frustrating--plumbing issues encountered in the home is a clogged faucet aerator. Fortunately, fixing this problems is simple enough that most homeowners can accomplish it on their own. If you would like to improve your DIY plumbing skills, read on. This article will teach you how to disassemble, clean, and reinstall a faucet aerator. A surprising number of people aren't aware of the function an aerator serves--let alone how to remove and repair one! The principal job of the aerator is to reduce the rate of the water flowing out of a faucet. This helps to conserve water and thus cuts down your water bill. In fact, aerators are so effective at their job that they can reduce the flow rate of a given sink by up to 30 percent. At their most basic, an aerator consists of a fine-mesh screen. This screen acts to slow the rate of water while also integrating air into the flow. Unfortunately, the screen is also susceptible to becoming choked with debris over time. This is often the result of hard water, which contains a high abundance of minerals like magnesium and calcium. These minerals accumulate in deposits often referred to as scale. Unless periodically cleaned, this scale will become pronounced enough to clog the pores in the mesh screen. This will hamper the flow to such a degree that it will seem to take forever just to fill a glass of water. The good news is that it's easy to get your aerator functioning the way it should with a thorough cleaning. The first step is to remove the aerator. In theory this is simple: you just unscrew the aerator from the tip of the faucet. Yet corrosion and scale often make this task more difficult. Try using a pair of pliers to work the aerator loose after first wrapping a rag around the aerator to prevent unintentional scratches or gouges. An aerator is made up of a variety of components, including rubber washers, plastic disks, the screen, and the outer shell. When disassembling the aerator to access the screen, be sure to lay these components out on the table in a clear order. That way you'll have a much easier time putting it back together again. 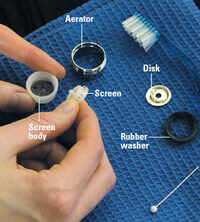 Use an old toothbrush or a plastic scrubber to gently remove scale from the screen. A pin may also be helpful for removing any buildup from the screen's holes. Tougher scale can be loosened up by soaking the aerator in vinegar. Once the screen has been thoroughly cleaned, simply reassemble the various parts and screw the aerator back into the faucet. Click here for more information about plumbing or to find a professional near you.